This was followed by a series of photographs, where the congregation were asked to determine if the image was real or fake . (I got about 30% correct myself ). The images showed how we can be mislead by what we see , and the final photo was of two men , both ostensibly Christian , but one was an actor posing with a Bible , the other was a Minister out on the front line in the Middle East . The Singing Company gave us the song ” Everybody needs something to live for” which was well sung and was received with a well deserved respectful silence . 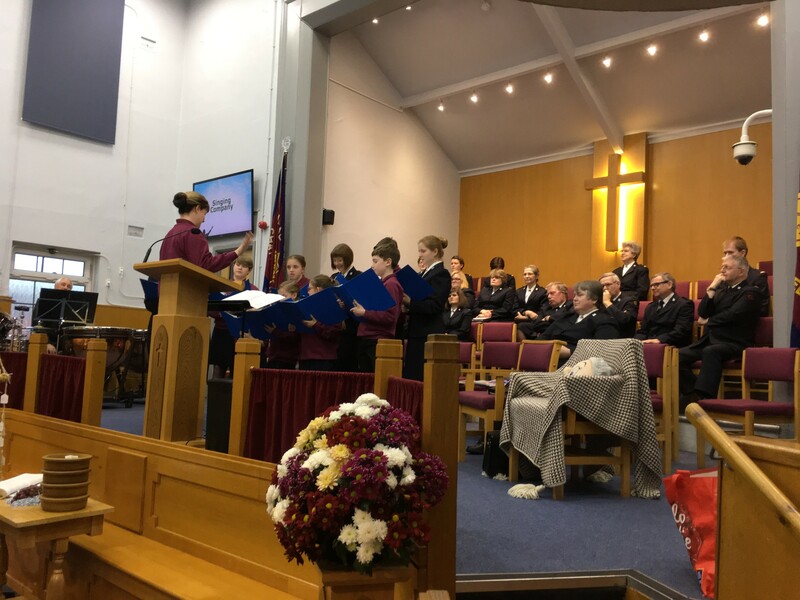 The afternoon meeting continued the theme of Commitment Sunday with the theme ‘Between You and Me Lord’ and was arranged and led by the Songsters. The opening song by the brigade was ‘He was there’ with the reminder that God is everywhere and in all things. 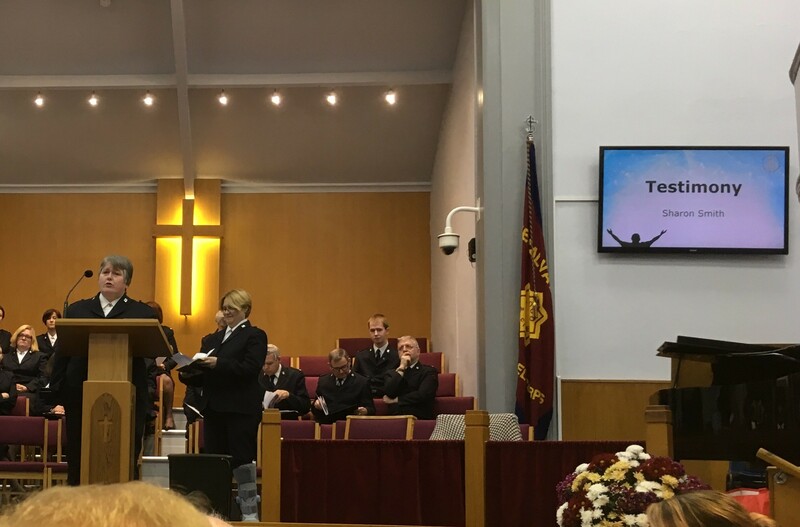 After Songster Sergeant Ruth Hardy had welcomed everyone there was a film clip from ‘Bruce Almighty’ which showed how overwhelmed he was when he received millions of prayers and dealt with them by saying ‘Yes’ to every one. What would we do if God said ‘Yes’ to all our prayers? Something to ponder. Major Alma Brown and Dawn introduced the song ‘Thou Art the Way’. 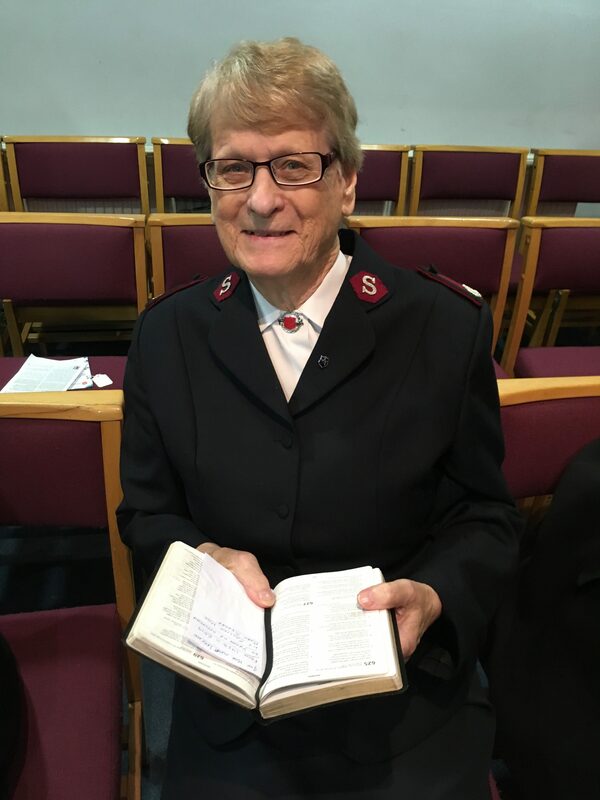 Major Alma explained how she felt the call of God upon her life when she was 18 and throughout all her service as an Officer in the Salvation Army she had truly dedicated herself to service to God. Jean Jones opened the meeting with prayer. 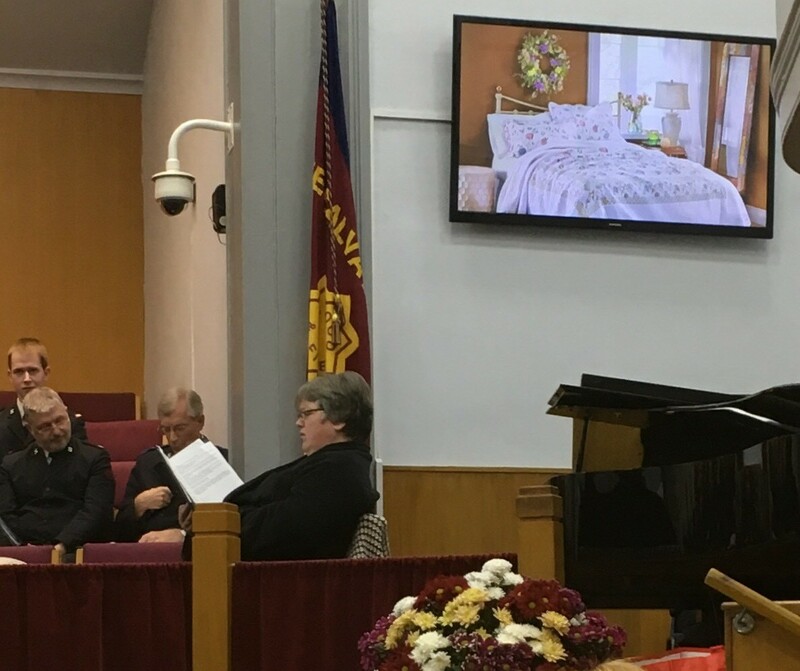 before Songster Sharon Smith testified to how she and husband Andy had followed God’s leading when they moved home to Chatham because of Andy’s work situation, then trusted in God to help them when they went through bereavement. The YP Band played ‘Spirit of the Living God’ and the Singing Company’s message was ‘At the Well’. 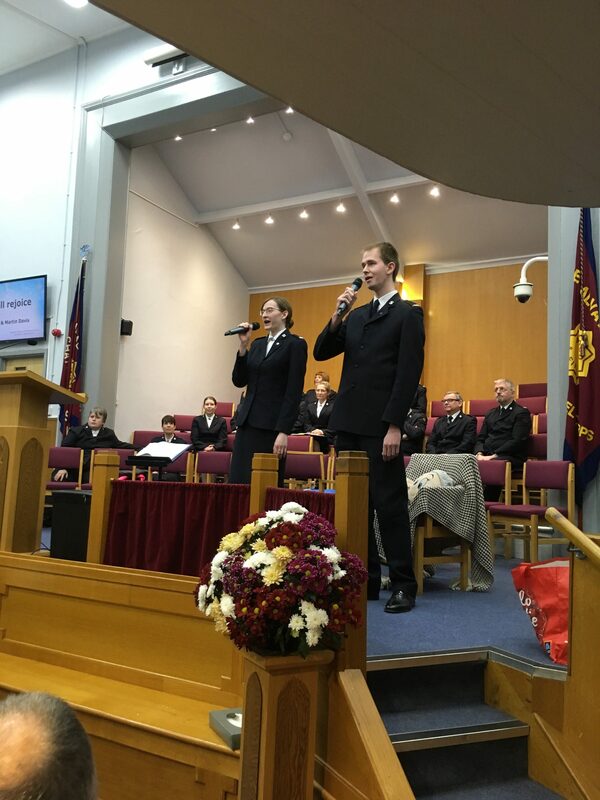 Songsters Emma and Martin Davis sang enthusiastically the vocal duet ‘I will Rejoice’ which was really uplifting. The Band brought the march ‘Heavenward’. Ruth then performed a sketch of The Lord’s Prayer which she had first performed when she was quite young when she was surprised to hear God’s voice questioning her as to whether she understood what she was praying as she went through the Lord’s Prayer. The Songsters followed by singing ‘I am praying’. Ruth brought the Bible thought which continued the theme of how we need to mean what we pray and trust God to answer. 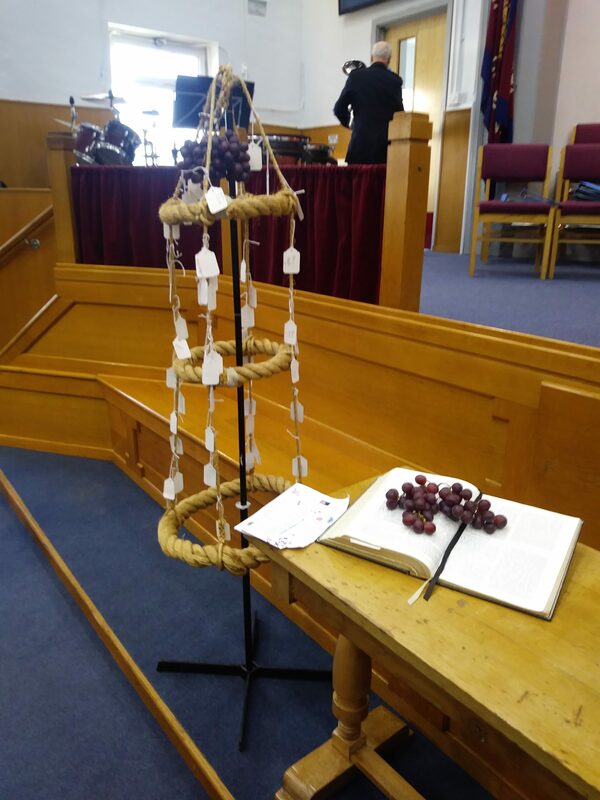 The Songsters’ song ‘I Surrender All’ gave time for additional reflection before Major Ian prayed and the Songsters sang the benediction ‘The Lord bless you and keep you’. This entry was posted in Church Life, Monday Spot, Spiritual Life. Bookmark the permalink.